either the mandible (lower jaw) or the maxilla (upper jaw), two opposing bony structures of the mouth of a vertebrate; they bear the teeth and are used for seizing prey, for biting, or for masticating food. See anatomic Table of Bones in the Appendices. cleft jaw a cleft between the median nasal and maxillary processes through the alveolus; see also cleft palate. Called also gnathoschisis. Hapsburg jaw a mandible that is prognathous, often accompanied by Hapsburg lip. See illustration. Hapsburg jaw with Hapsburg lip. 1. One of the two bony structures in which the teeth are set to form the framework of the mouth. 2. Common name for either the maxillae or the mandible. (jaw) either of the two bony tooth-bearing structures (mandible and maxilla) in the head of dentate vertebrates. cleft jaw a cleft between the median nasal and maxillary prominences through the alveolus. Hapsburg jaw a mandibular prognathous jaw, often accompanied by Hapsburg lip. a. Either of two bony or cartilaginous structures that in most vertebrates form the framework of the mouth and hold the teeth. b. The mandible or maxilla or the part of the face covering these bones. c. Any of various structures of invertebrates that have an analogous function to vertebrate jaws. a common term used to describe the maxillae and the mandible and the soft tissue that covers these structures, which contain the teeth and form the framework for the mouth. See also jaw relation. 1. One of the two bony structures, in which the teeth are set, forming the framework of the mouth. 2. Common name for either the maxilla or the mandible. An early embryonic malformation resulting in lack of fusion of the right and left mandible into a single bone. 1. 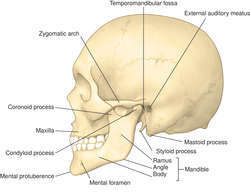 The mandible, the U-shaped bone that articulates with the base of the skull high up in front of the ears. 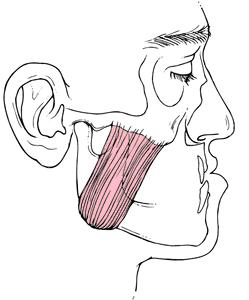 In biting and chewing (mastication) the mandible is pulled upwards by powerful muscles running down from the base and temples (temporal bones) of the skull. 2. The MAXILLA, or upper jaw. the mandibles of any animal. The term is usually restricted to the bones surrounding the mouth of vertebrates, the (paired) upper jaws being referred to as the maxillae and the lower as the mandible. These bones carry the teeth where present, and are often used for crushing purposes. 1. One of the two bony structures in which teeth are set to form oral framework. 2. Common name for either maxillae or mandible. n a common name for either the maxillae or the mandible; the meaning is usually extended to include their soft tissue covering. n an abnormal bladderlike sac within the jaw. May occur in either the maxilla or mandible associated with or not associated with the dentition and its formation. See also cyst. n See lesion, fibroosseous jaw. n a break in the continuity of the bone of the maxilla or mandible. See also fracture. either of the two opposing bony structures (maxilla and mandible) of the mouth of vertebrates; they bear the teeth and are used for seizing prey, for biting, or for masticating food. the mandible or maxilla, especially the mandible. involuntary, rapid, repetitive clenching of the teeth; accompanied by frothing of saliva; frequently accompanies clonic convulsions. involuntary, rapid clicking together of the teeth without salivation and usually accompanied by generalized shivering; in animals, may be a sign of painful teeth. a dislocation of the jaw, usually following wide opening, in which the mouth cannot be closed. See also temporomandibular dysplasia. a dental gag used to keep the jaws of an animal as open as possible. A. weird. swelled up fast? does she have problem breathing? if so- it could be an allergic reaction. if she has problems breathing - GO NOW TO AN ER!!! if it took a little bit - could be food that got stuck in her gums really hard causing an edema. if it was slow (over night) could be an abscess in her tooth (a tooth decay that penetrated to the dental pulp). any way i would go check it out. Jawed Habib Hair Beauty Ltd.